Artist Keith Roper was born in Fillingham, Lincolnshire in 1946. He studied painting and graphic design at the Lincolnshire College of Art and Design. 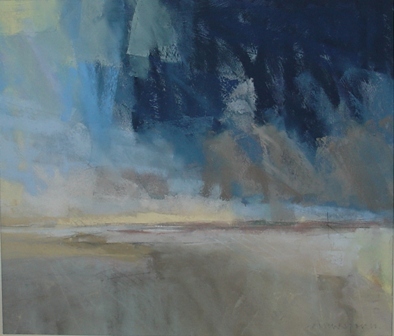 He has exhibited with the Lincolnshire Artists’ Society since 1966, of which he was the chair in the late 1980s, and was elected to membership of the Pastel Society in 1995. His paintings are mainly landscapes and townscapes of Lincoln and the surrounding countryside; Lincoln Cathedral being a focal point in many views. Lincoln’s social and economic history has changed dramatically over the years. Its effect on the city landscape is portrayed in many of his paintings. Other subjects include, The Solent, the North East coast and his great passion – The Fens around Ely. “I try to create a feeling of atmosphere about the picture through colour and the application of paint. The sky and weather is of particular importance in creating mood and sensitivity”. Roper paints mainly in pastel but also uses acrylic, oil and watercolour. “Pastel requires no drying time, it is an instant and direct form of painting using pure ground pigment”. Hello friend. My, you have done so well through out your life. I am so thrilled for you. That wonderful smile of yours has been such a gift.!! I can still see you smiling with Ian Riva, and having a joke.!! Your paintings look incredible. You truly are a gifted soul. Bye for now, from Anna.